Besides using the iPad in bed and on the couch, you know the reason you bought this thing was for toilet entertainment. Verdict: It's decent but distracting—and sometimes dangerous. Here's half the problem. In order to get your pants down for a #2 session (or zipper down for #1, if you're a dude), you have to use both hands. That means you need to place the iPad down somewhere. Not every bathroom is constructed with enough flat surface space to safely hold an iPad while you de-pants. The back of the toilet is fine, if slightly dirty, and the toilet lid is another option if you want to remove your clothing first, pick up your iPad, and then reposition yourself. The top priority is to not break your iPad, though not getting it dirty comes in a close second. Like luggage in an airport, any time the iPad leaves your hands means it's time to worry. Overall, not so good. Stand-up #1 use isn't too bad, but you're limited to holding the iPad with one hand only, which means you can only read, not interact, with whatever's on screen. Consuming things, like Netflix or iBooks (the latter of which you can set to advance pages when you hit the left border) makes the most sense. But the iPad is heavy and slippery, so this is undoubtedly a gamble every time you pee. Nevertheless, you're a man (presumably), so grab hard and live dangerously. Too heavy for long-term one-handed use, but you're not going to be engaged for a long time unless you just came home from a bar or a Nintendo Wii competition. Now this is why you're here. How does the iPad fare sitting down? Pretty well actually, once you've got your pants lowered and are in the final position. You should definitely grasp it with two hands most of the time, but when scrolling and tapping, you'll have to cradle it with one hand like a gym coach. It's much like standard iPad use elsewhere, except you probably shouldn't place it onto your lap. That's not to say it's not physically doable, but depending on the coefficient of friction of your bare legs, flying fluids and various other factors, the slick-backed iPad might end up on the ground instead. BUT—and this is a big one—the iPad is way too distracting right now to realistically use while you're doing your business. Instead of concentrating on the task at hand, you're flicking through Twitter, reading books, responding to emails, browsing the web, shooting triangles in Geometry Wars, slashing zombies or directing planes onto runways. That leaves little time left to do what needs to be done. Unless, of course, this is an urgent run, then the iPad's distractibility is no problem. Much like setup, your bathroom denouement requires you to let go of your entertainment device. This relies, again, on your restroom arrangement, and will be acceptable or not depending on your own circumstances. If someone would make an iPad case that mounted onto the wall, this wouldn't be an issue. So what's the verdict? 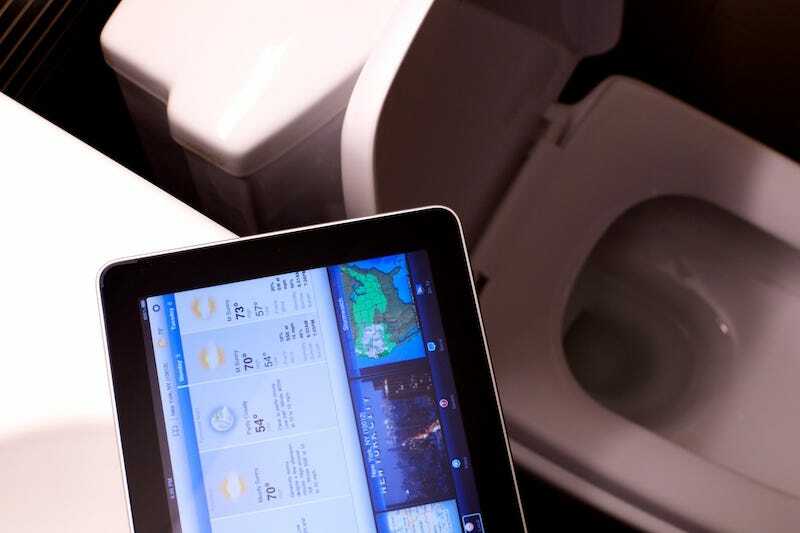 Is the iPad better or worse than magazines and newspapers and books while you're on the can? Definitely better, because it can simulate all three, plus broadcast to the world that you're currently in the middle of shitting. You lose, old media.